It’s easy to believe that anything is possible in New Zealand. And therefore, one can’t fault the mind when it flies to the most illogical of explanations when confronted with an unusual sight. That is the first thing I think of when I see them. It’s fairly early in the morning, and we are on our way, driving down New Zealand’s South Island. We are coasting down Highway 1 along the eastern shore, making our way to Dunedin. Shortly after passing Oamaru, we come upon the little town of Moeraki, and its famous Koekohe beach. And there they are, lying on an empty expanse of golden sand. 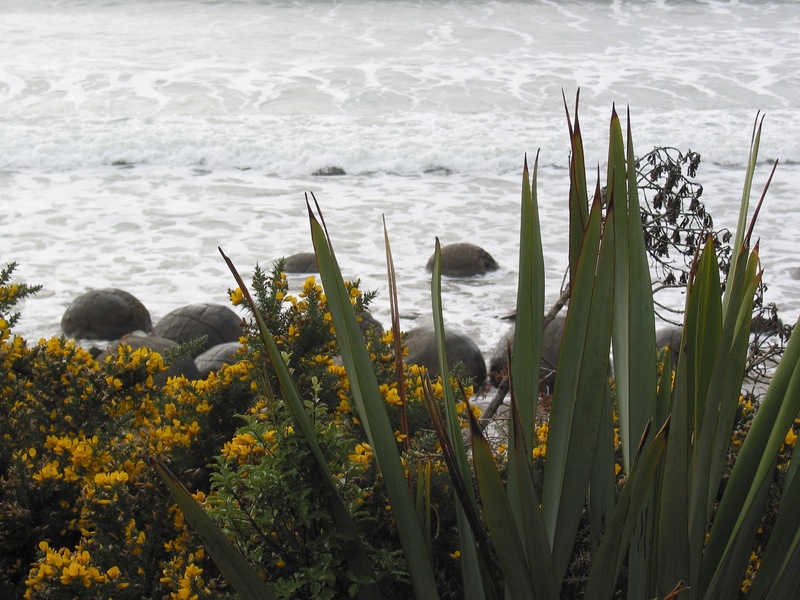 Every beach has boulders – rocks and stones sticking out of the sand. They add that much needed balance and perspective to a flat shot, function as instant clothes hangers for towels and wet swimwear, and their recesses provide endless fascination for those looking for interesting marine life forms. 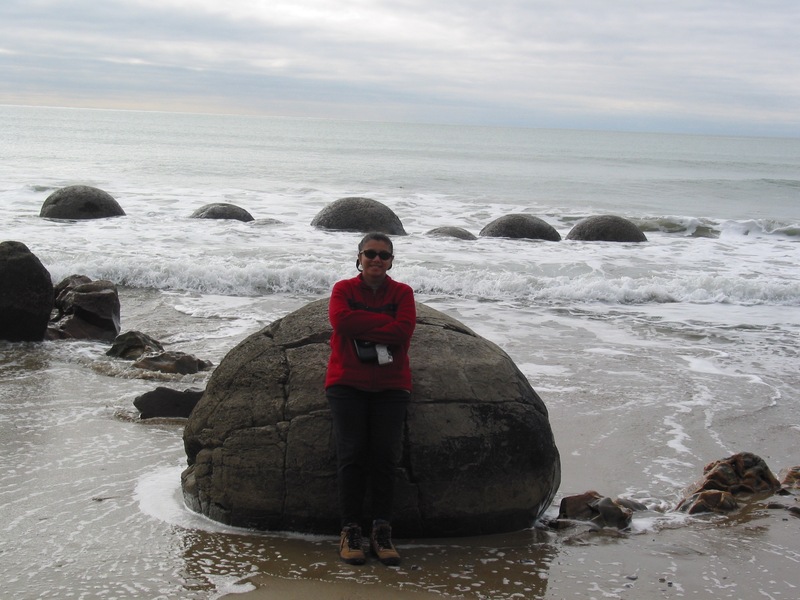 What is special about the Moeraki boulders is that they are spherical, and their round shape is as unusual as it is photogenic. 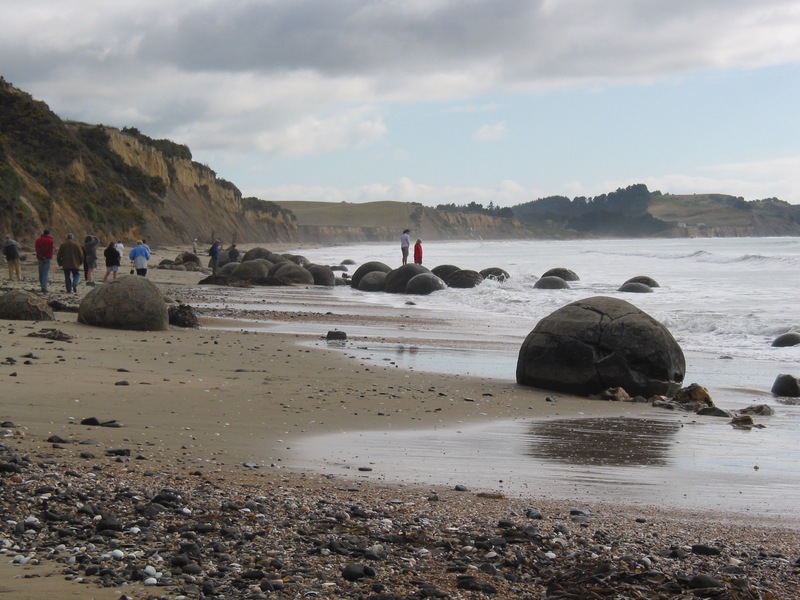 According to the Maori, these boulders are eel baskets that were scattered on the coast after the sinking of a legendary canoe called Arai-te-uru. According to legend, the rocky shoals that extend outward from this point is the hull of that canoe. The truth, however, as it usually is, is more simple. The boulders are what geologists call concretions. These are formations that are created by the hardening of sea sediment which has been exposed because of sea erosion. Around 60 million years ago, in the Palaeocene era, marine mud began to harden into stone on the surface of the sea floor. The constant pounding of waves over millennia has eroded the outer softer stone, and uncovered the compacted spherical stone underneath. 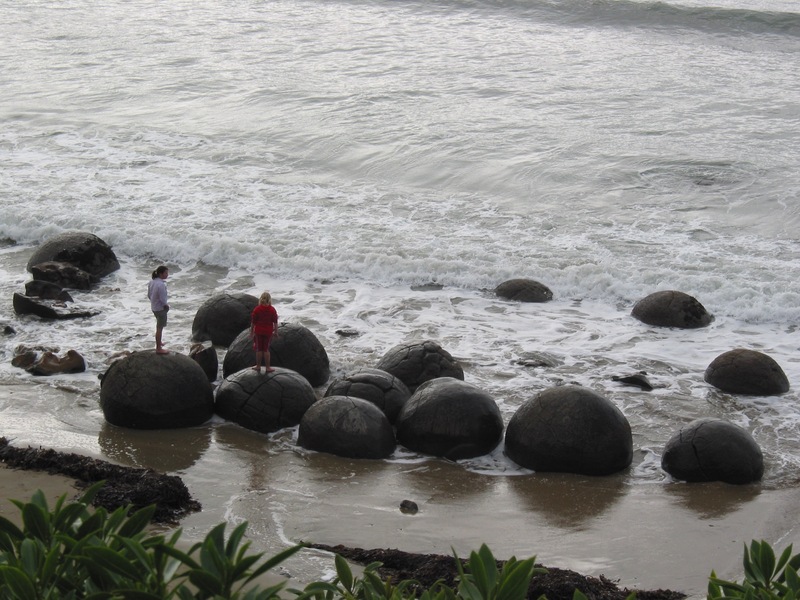 Some of the boulders measure up to 3 metres in diameter, while others are smaller, ranging from 0.5 to 1 metre. Usually the centre part is the weakest, while the outer shell, composed mainly of calcite, tends to be stronger. As we walk around the boulders, we can see that some of them have fissures and cracks on them. 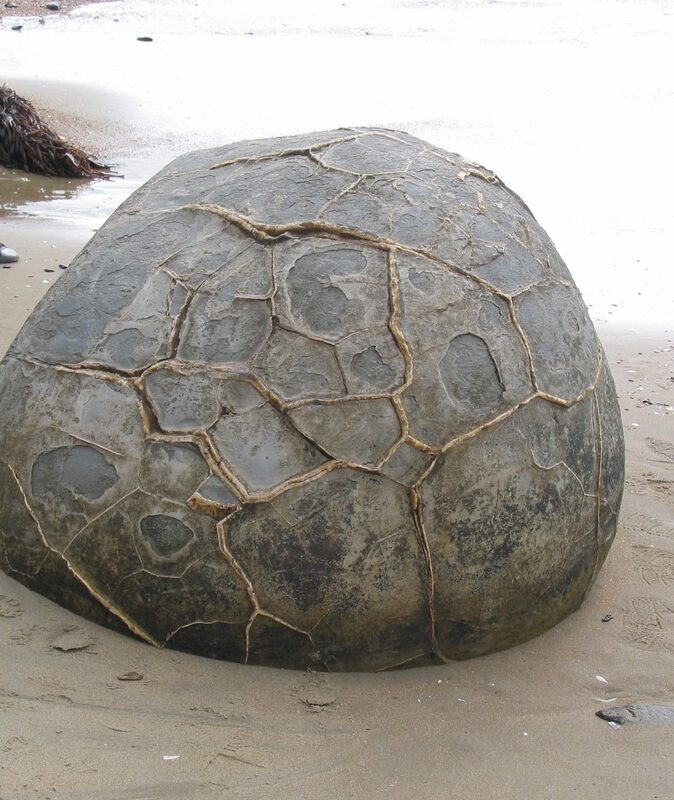 These are called septaria, and this happens when natural cracks in the stone get filled in with small amounts of dolomite and quartz, as well as yellow or brown calcite, which gives the stones their veiny, mottled appearance. Logical explanations, all. But as we walk back to the car, I turn around and look at them, lying in the morning sun, and I think – yeah, I like my version better.